Is there any other city in the world whose cathedral has been rebuilt as many as seven times? The first cathedral was constructed in 1581, damaged by a typhoon in 1582, and destroyed by fire in 1583. The second cathedral is rebuilt using stone, 1592, destroyed by earthquake damage in 1600. The third cathedral is constructed in 1614, destroyed by earthquake damage in 1645. The fourth cathedral is constructed between 1654 and 1671 by Bishop Miguel Poblete. Juan de Uguccioni built the new fifth version of the cathedral in 1750, achieving a harmonious construction upon the remains of the old cathedral, which had not the least symmetry or decoration. The new cathedral was: admired by all who contemplate it; they never tire of wondering how in this distant land it has possible to apply the exact rules of such a stringent architectural form. 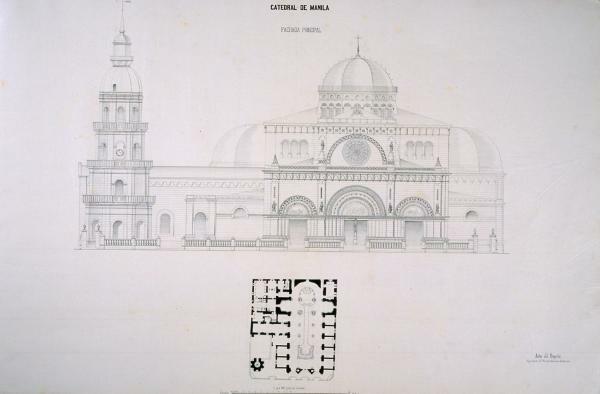 The fifth cathedral was heavily damaged by the 1863 earthquake, and plans for the construction of the sixth version were undertaken between 1870 and 1879, in accordance with the project drawn up by Serrano Salaverri. This new cathedral was the fruit of eclecticism at its purest, reproducing the Romanic style which was so in vogue in Europe during those 19th century years. Designed to withstand earthquake damage, its author was to have no inkling of the destructive power that mankind was to hold in the palm of its hand, and which would be used just seven decades later to destroy his work. Today, the seventh version of the cathedral still stands. 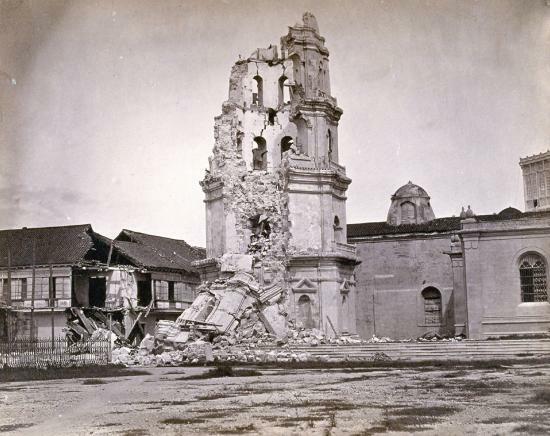 The cathedral tower after the 1880 earthquake. Francisco van Camp. 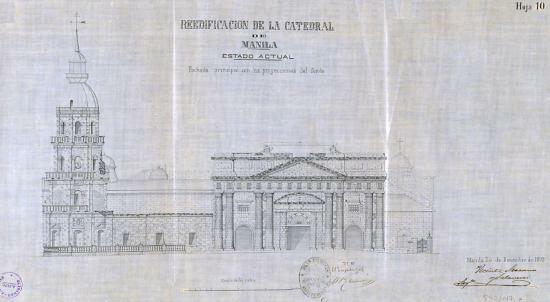 SHM The 1880 earthquake caused considerable damage in the city of Manila, and particularly to the octagonal, four-section structure of the cathedral. Preliminary project for the ground plan. 1870. 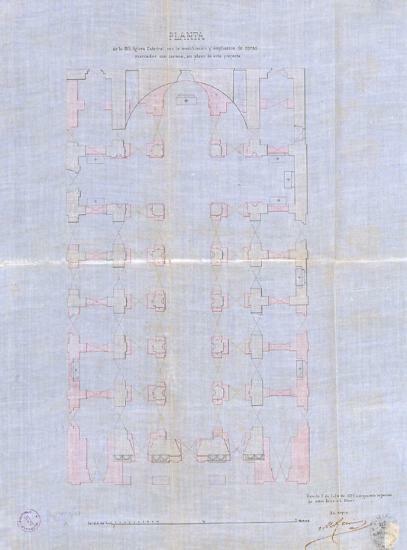 AHN Drawing made by Luciano Oliver of the works being undertaken on the cathedral in a preliminary project incorporating two naves with chapels. 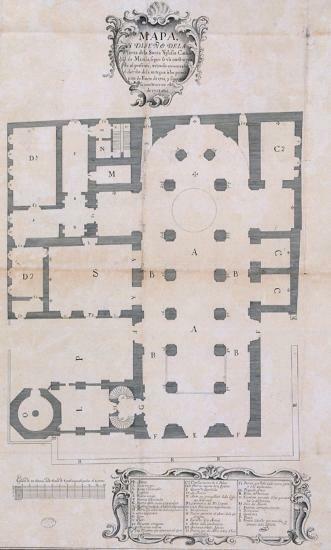 Condition of the ground floor of the cathedral in 1863, according to Vicente Serrano Salaverri. 1872. AHN The 1863 earthquake caused serious damage to the old cathedral. 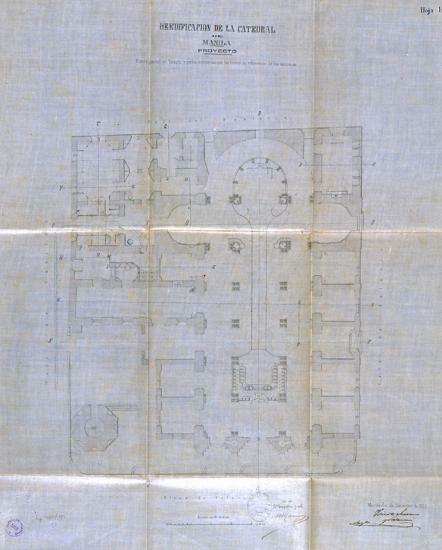 Its ground plan with three naves was designed by Salaverri when he took charge of the reconstruction works in 1871. 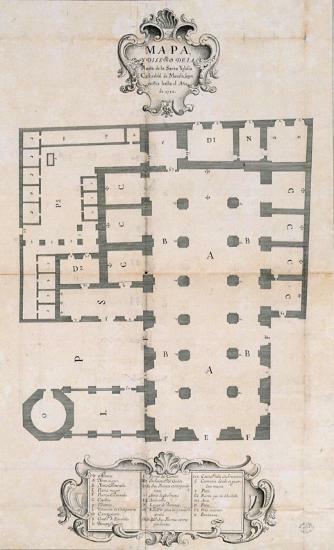 Ground plan of the cathedral in 1753. AGI The cathedral was first built in 1581 of cane and nipa palm, and was destroyed by fire in 1583. Drawing of the oldest picture of the cathedral still preserved. 1750. AGI Manila cathedral was reconstructed on several occasions as a result of damage caused by earthquakes, cyclones, fires and other causes bringing ruin to the building. Preliminary project for the main façade. Vicente Serrano Salaverri. 1872. 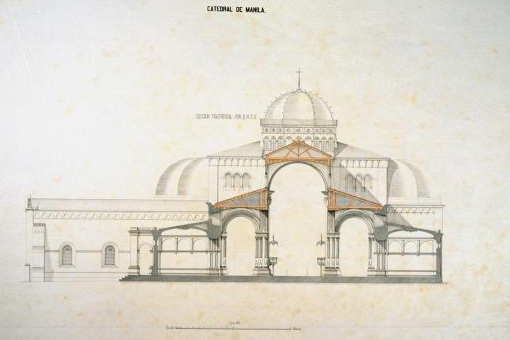 AHN The architect proposed for the cathedral reconstruction works the use of granite for the ashlars and base, volcanic rock for the foundation bed, cast iron for the framework, and hollow blocks for the upper section of the façade, the arches and the wall panels. 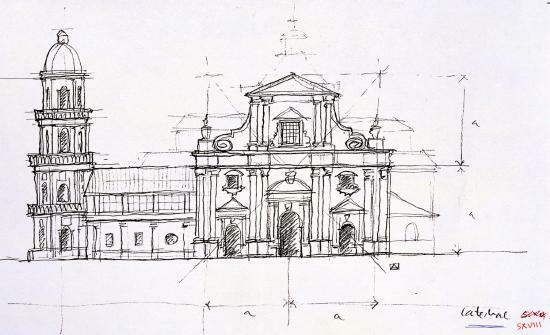 Main façade and ground plan. Vicente Serrano Salaverri in Colección de planos... 1876. BETSICCP, Madrid Salaverri drew up the project for a building in the neo-Romanic style, with oriental influence geometric decoration reminiscent of Byzantium. Main façade. Vicente Serrano Salaverri. 1872. 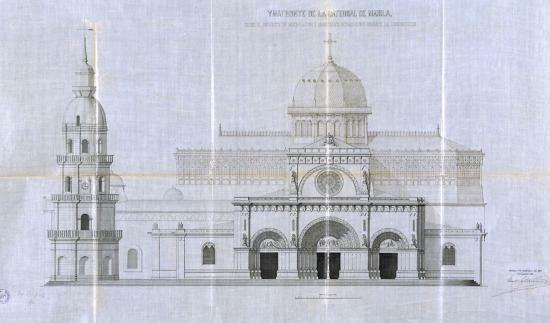 AHN This was the condition of the main façade, built in the classical style with heavy Doric columns, after the 1863 earthquake, according to a drawing made by Salaverri for the purpose of restoration works. 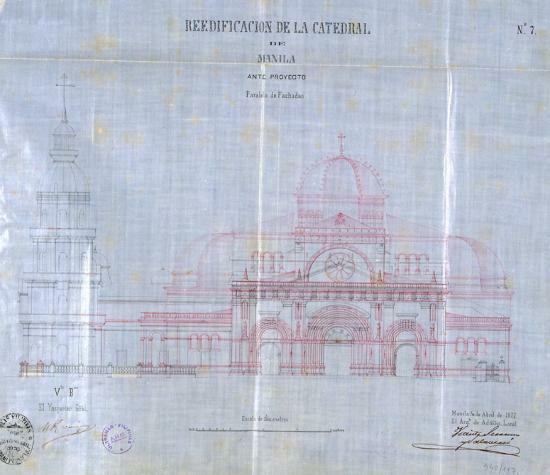 General ground plan of the cathedral in the project drawn up by Vicente Serrano Salaverri. 1872. AHN In this ground plan the architect extends the choir and changes the shape of the transept arm extremities from square to semicircular. 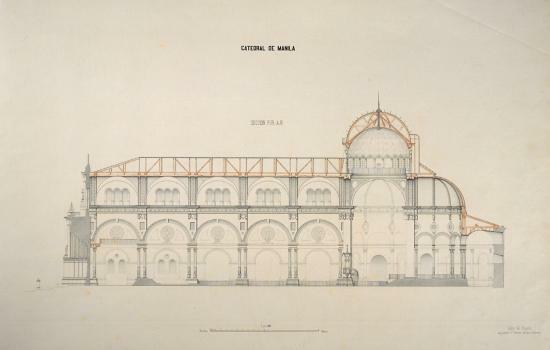 Timber framework for the reconstruction of the roof for the preliminary project drawn up by Vicente Serrano Salaverri. 1872. AHN Rising from the cathedral roofing is an octagonal dome with groups of three large windows on each of its sides; it is topped with red copper laid in fluted laminas. Cross-section. Vicente Serrano Salaverri. 1872. BETSICCP, Madrid Project for the roof over the naves, with twin round arch canted groined vaulting supported on groups of four columns and twin pilasters. Longitudinal section. Vicente Serrano Salaverri. 1872. BETSICCP, Madrid An endeavour was made to maintain the same style on the interior of the naves as on the exterior with a profusion of gilt and distemper murals by the Italian artist Giovane Dibella. Main façade. Signed by Francisco de Castro Ponte, chief engineer. 1894. 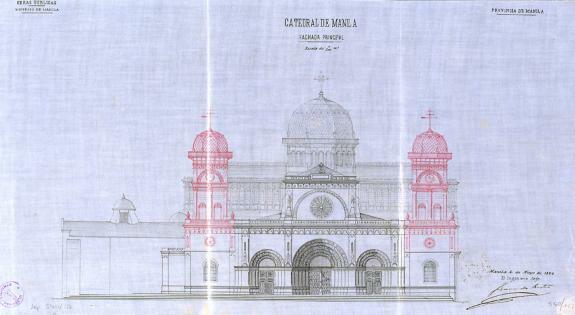 AHN Project for the construction of two twin towers for Manila Cathedral. 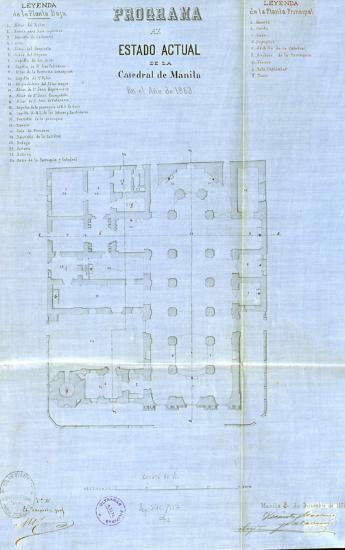 Ground plan of the cathedral. Signed by Manuel Ramírez Bazán, the inspector general, in 1882. AHN After Salaverri, the work was continued by the engineer Eduardo López Navarro, and after this by Manuel Ramírez Bazán, who presented another solution with a project in which the tower was free-standing. Main façade with the modifications incorporated during its reconstruction. Eduardo López Navarro. 1877. 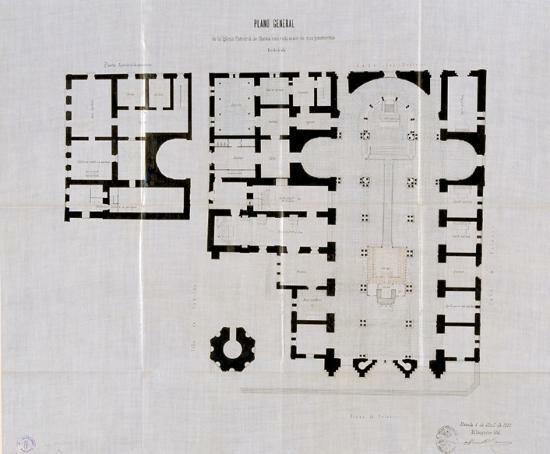 AHN Plan showing the change made to the second section of the façade and to the type of roofing, which are reminiscent of those used in iron architecture.